A premium high temperature aluminum/copper based lubricant designed especially for use in the demanding field of demolition tools. :Extends the life of your tool and bushings several times. :Use much less of HHTP than you would have with regular EP grease and achieve better results. Use a convenient re-fill press to empty an entire cartridge into an automatic hammer lube system or use a hand or electric grease gun for periodic lubrication of your tool. Use these convenient sizes for bulk refilling of automatic lube system reservoirs. 5 gallon pails can use an L-5GF-1 hand pump filler on the 5 gallon pails for clean, easy, and fast filling of your automatic lube system reservoir. 2 lb bags are sold and shipped 5 bags to a plastic pail and 4 lb bags are sold and shipped 7 bags to a plastic pail. 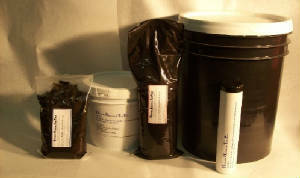 The pail protects the bags during shipping and until they are used. Simply cut the corner off the bag and squeeze into the reservoir of your hammer automatic lubrication system. This method is clean and has very little wastage of the product. Quality Lubrication Fittings offers several automatic lubrication systems for use with the HHTP product. This electrically operated system is available with a 4 kg (8 lb) or an 8 kg (17 lb) reservoir. It features a SEP-8 control for shut down of the auxiliary hydraulic system operating the breaker/hammer when the reservoir reaches a low level condition. This insures that the breaker/hammer does not operate unless lubricant is being fed to the tool. This saves wear and tear on the tool. The HDI-H pump is a hydraulically operated system tied directly into the auxiliary hydraulic lines. The pump turns on whenever the auxiliary hydraulics operating the breaker/hammer is engaged. The amount of lubricant delivered to the tool is controlled by means of a flow control valve at the base of the pump. The HDI-H pump can be shut off by turning off the ball valve on the pressure supply line at the base of the pump. Automatic shut down of the auxiliary hydraulic system or an audible alarm when low level is reached in the pump reservoir are available as an option.